The key driving factor for the development of the global Alzheimer’s drug market is the increasing prevalence of the disease in the developed countries in the West. Numerous neurodegenerative disease have become increasingly prevalent in the countries such as the U.S. in the past few years, leading to a steady support from the government to develop drug for treatment. This has thus resulted in a highly favorable market conditions for the drug manufacturers of the Alzheimer’s disease and consequently driving the growth of the market in the region. Also there is an increasing awareness among people about treatment of the Alzheimer’s disease which has further contributed in the driving the growth of the global market. The global Alzheimer’s drugs market stood at an overall valuation of US$3.6 bn in the years 2017. This valuation is estimated to reach to a figure of US$6.4 bn by the end of the given forecast period of 2017 to 2025. This growth in the overall market valuation is expected to be achieved at a steady growth CAGR of 7.5% over the course of the given forecast period. The global market for Alzheimer’s drug can be segmented depending on the class type of the drug, distribution channel, and regional segmentation. Depending on the drug class, the Alzheimer’s drug market can be further segmented into memantine, cholinergic, and combined drugs. Memantine drug type dominated the global market for Alzheimer’s disease in the year 2016 owing to large scale expiry of patents of major products and a restricted number of drugs to treat Alzheimer’s disease. This segment of memantine drug is expected to dominate the market in the coming years of the forecast period. The cholinergic segment is also expected to contribute largely to the overall market share of the global market for Alzheimer’s drug and is projected to expand at a healthy growth rate over the forecast period because of the limited availability of the productive drug classes across the globe. The sales of combine drug class increased in the year 2016 when compared to its past record, and is expected to grow at a significant pace over the course of the given forecast period of 2017 to 2025. Depending on the geography, the global Alzheimer’s drug market can be segmented into key regions such as Europe, Asia Pacific, North America, Latin America, and the Middle East and Africa. The regional market of North America accounted for the highest share in the global market for Alzheimer’s drugs in 2016 because of the large number of patients suffering from the Alzheimer’s disease and growing awareness among the regional population about the treatment of the disease. 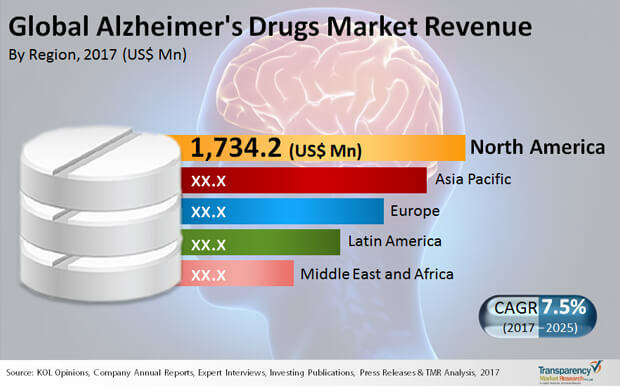 The North America market for Alzheimer’s drugs stood at overall valuation of US$1.7 bn in 2017 and is estimated to rise over US$3 bn by the end of the given forecast period in 2025.The regional market of Asia Pacific, on the other hand, is projected to show a strong growth CAGR of 8.6% during the give forecast period of 2017 to 2025. Some of the key players in the global Alzheimer’s drug market include names such as H Lundbeck A/S, Ono Pharmaceutical, Johnson & Johnson, Eisai Co Ltd., and Daiichi Sankyo Company Limited among others.